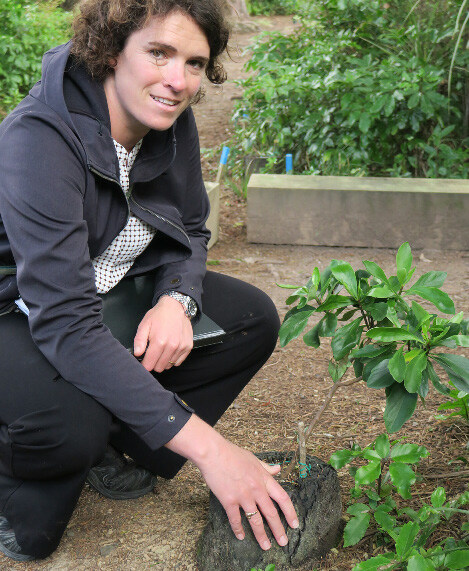 Danielle Shanahan with a trial planting of a Kirk’s Daisy in which the sapling is planted within a ponga log. Experiments in a variety of restoration techniques are being trialled all over Zealandia. 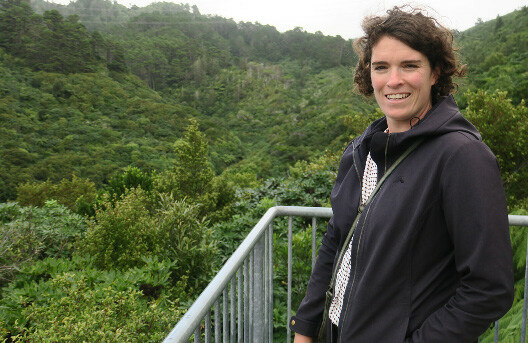 Dr Danielle Shanahan is Manager of Conservation & Research at Zealandia, a 225 ha wildlife sanctuary that lies in the centre of New Zealand’s capital city of Wellington. It’s not a zoo or a museum but a world-first experiment on how to combine effective restoration and threatened species management in the shadow of a major city. Danielle is also a CEED Alumni, and was previously based at the University of Queensland where she analysed the many benefits of interacting with nature (see Decision Point #98). Here she explains the unique multiple values of a sanctuary like Zealandia, and reflects on the importance of her time with CEED in navigating the complex challenges that Zealandia has to deal with. Zealandia is like no other place on Earth. Some have described it as a prehistoric paradise, which is apt given it hosts the ancient tuatara, a reptile-like animal considered to be the closest living relative of the dinosaurs; the giant weta, an enormous wingless grasshopper-like insect; and flightless birds once common across New Zealand. Others have hailed it as a bold new idea in conservation, which is also true for the sanctuary is in many ways a great example of a novel ecosystem generating important natural values. But the truth is it’s both, and much more. Zealandia is an ‘island sanctuary in a city’. It was established around 20 years ago when local conservationists, led by James Lynch QSM, worked with the Wellington City Council to convert a redundant water reservoir into a predator-free nature reserve. The two dams on the site are still here but now serve as habitat for water birds and other species. The slopes of the reservoir, once bare with a few clumps of exotic pines, have been replanted with native vegetation. The old pines planted on the upper slopes are slowly being replaced with native trees. The predator-proof fence, over 8 kilometres long, keeps out rats, cats, stoats, possums and hedgehogs; all introduced mammals that have decimated New Zealand’s native fauna. New Zealand’s rich native bird life, having evolved in isolation from mammals, has proved particularly vulnerable to the introduction of mammal predators. Many of New Zealand’s iconic bird species now only survive on remote islands off the coast. The predator-proof fence, in many ways, makes Zealandia a bit of an ‘island’ too. But this island lies in the heart of a city. And our close proximity to people throws up heaps of challenges and opportunities. For example, how do we balance our 500year restoration goal against the need to let visitors interact with the sanctuary (a central goal of the sanctuary is to foster the connection between people and nature)? What is the best, most cost-effective and efficient way to monitor for incursions of mammal predators (they are all around us after all)? How do we ensure that birds flowing out of the sanctuary are safe and can continue to disperse across the landcsape? And, as our restoration efforts continue, what species should be prioritised for release? The view out over Zealandia from one of the many lookouts throughout the sanctuary. It’s difficult to believe a major city lies just over the hill (or that these slopes were once cleared and barren). Of course, readers of Decision Point will recognize that questions like these are grist to the mill for an environmental decision scientist. As Manager of Conservation & Research at Zealandia, however, I’m actually making the decisions around many of these issues. So, this is for real, and it’s tough. Just as we always say in our science papers, conservation managers usually have to make decisions quickly, with inadequate resources under enormous uncertainty; and decisions relating to threatened species potentially have enormous consequences (especially if you get it ‘wrong’). Yes, there’s a growing catalogue of research on how to make better environmental decisions (I’d like to think I have contributed to it), but out in the real world decision making is messy, noisy and often confusing. Sometimes it’s obvious what the appropriate course of action is and your decision making can be transparent, accountable, efficient and adaptive. Often it’s not. A baby tuatara. 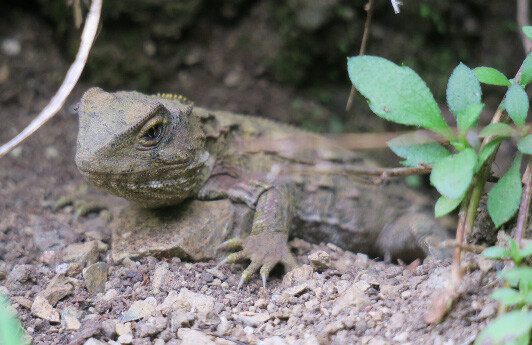 Zealandia is one of the few places on the planet where, with a little searching, you can observe tuatara ranging free in their natural habitat. Decision making in the real world often doesn’t look like decision making described in academic journals. But that’s OK—I have found that the science combined with my experience at CEED has provided me with the skills I need to approach each challenge in a considered and logical manner. Always in the background of what I do are questions about what is it I am trying to achieve (the objective), what are the options available to me, and what are the trade-offs between these options? There are no perfect or final solutions, but there are options that are fit-for-purpose, cost-effective with results that enable us to learn more about the systems we are managing. CEED was instrumental in teaching me this. But it is also an important network of expertise that I continue to interact with and draw on (I have several projects on the go with CEED colleagues). CEED also taught me the importance of the many values that feed into effective conservation. It’s not just growing the numbers of a particular threatened species (important though that is). It’s also how people (and different cultures) regard and care for that species or ecosystem. Zealandia’s position in the heart of a city is an important part of our conservation mission and potential. 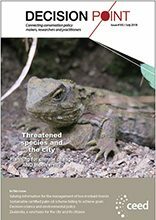 People in Wellington (and visitors from other parts) are seeing threatened species in a natural setting, and increasingly in their own backyards! All species are important, but not all are equal when it comes to advocacy and popularity. Some species, like the Critically Endangered takahē (a flight-less ground bird related to the moorhen) requires extra investment to support but is invaluable when it comes to generating excitement and interest in conservation. The sanctuary contains three takahē, and when it comes to resource allocation and prioritisation, these birds are considered especially important. Several other species are doing so well that they are spilling out from the sanctuary into the surrounding suburbs. Exotic mammals still prove a challenge for these birds but some species are doing quite well—this is sometimes referred to as the halo effect. It is occurring in part because surrounding communities are becoming excited about the reality of being a ‘nature-rich’ city. People are working to revegetate the surrounding landscape and manage pest animals. The sanctuary provides high quality habitat for threatened species but also encourages the improvement of the surrounding land, leading to threatened species spreading out from the sanctuary. One of three takahē which call Zealandia home. The birds have high advocacy value, but require significant time and resources to keep. Indigenous values are also important to the work of Zealandia. We’re currently looking to reintroduce a native freshwater mussel, kākahi, an important ecosystem engineer in terms of water quality but also a valued food item of Māori. It will be interesting to see how well we can engage the broader public with the reintroduction of a rather uncharismatic bivalve as compared to the super charismatic takahē. In my experience infecting people with my own excitement will be the key here! I think it would be safe to say that Zealandia is ticking many conservation boxes. Numbers of many threatened species are on the rise and public support for our work is growing. Zealandia has enlisted the aid of hundreds of community volunteers (who give thousands of hours of their time) and tens of thousands of local people have joined up as Members of Zealandia (paying an annual subscription). On top of this we have an active program of research with over 50 researchers involved in some way. For all that, Zealandia is still a work in progress, with a vision of ongoing improvement that looks centuries ahead (which happens to be the life span of some of the biggest and oldest native trees that used to be found here and that we are replanting now). Of course, we don’t know what the longterm future holds but we’re confident we’re making the best decisions we can for whatever unfolds. Interested? Why not come and check us out for yourselves? When it comes to conservation management, New Zealanders do particularly well in two areas. One involves the trapping of mammal predators. The other relates to building effective predator-exclusion fences. Zealandia excels in both regards, and is always looking at ways to improve their practice. 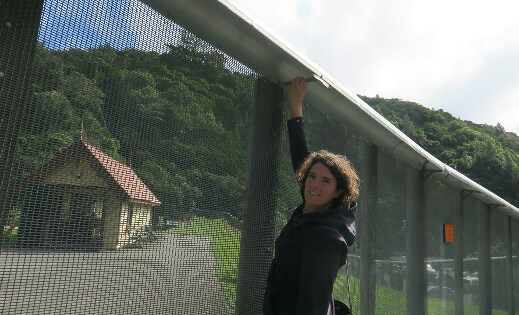 Danielle is pictured here outside of the Zealandia exclusion fence. She’s pointing out one little innovation they have developed – a metal flap positioned under the nut that secures the fence’s capping. They discovered that mice could use their tales to grab onto the nut and get over the capping, something prevented by the addition of the metal flap.